Do you want to learn how to let go of your inner stress? We show you simple, efficient methods that you can practice daily on your way to better physical and mental health. Have you ever felt a tingling sensation in your blood and nerve pathways or an absolute emptiness of the mind when meditating? That’s what you can experience while meditating and much more …. Since October 2016 we already have several weekend yoga healing retreats with Yogi Sarath Chandra and one small group of max. 10 participants. They took place for the first time in Wasserfallen (BL) and then in the house Serona, close by the water at Bremgarten AG. During the retreats, the master in Hatha and Kundalini offer yoga, meditation, personal chakra healing and hatha yoga. At the Yoga Healing Retreats, more enthusiastic guest-teachers for Yoga & Meditation with their lectures around our program. We are very happy to count Avelino Casas (Hatha Yoga & Vinyasa Flow) and Bernhard Eisenbarth (Meditation) among our existing staff of the experienced Teacher Team! The great enthusiasm for yoga is always directly felt in Avelino’s humorous, harmonic lessons. He always manages to arouse the students’ passion for yoga. Bernhard Eisenbarths quiet way of talking about his many years of meditation experiences, which he has collected throughout the world over the years and his talent to guide the meditations, are a great addition to our Yoga Healing Retreat. In 2018, the project will be continued and even expanded. A two-day Yoga Healing Retreat and a five-day Chakra Awakening Retreat take place each month. 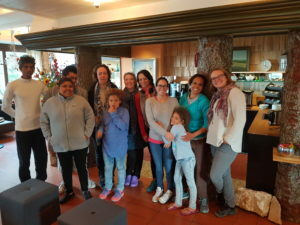 The retreats take place in small groups, because the family-friendly atmosphere and the personal individual care during the retreats are very important to us. The retreats are held in English (Sarath) and German. Our Guest Teacher at the Yoga Healing Retreat speak both. On request, a translation into Spanish, French, Italian, Singhalese and Romanian is possible. It’s about strength to refuel. “Your batteries” are recharged with positive energy through personal healing, yoga and meditation. The Healings can be very supportive of stress, burnout, depression, sleep or anxiety disorders, physical ailments, general illnesses (unless they are genetic! ), false awakening Kundalini energy, or simply letting go of old emotional burdens. For therapists, the Healings can be extremely helpful for increasing your own energy potential in the therapy. Our goal is not complicated contortions, but to achieve optimal success of the Healings by relaxation, relaxation, relaxation. Every Saturday and Sunday, Sarath gives personal sessions during the day. Each participant is entitled to receive healing on both days. 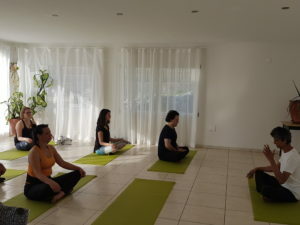 There are more yoga and meditation classes held by enthusiastic guest teachers at the retreats, so you can get to know different yoga / meditation styles. In the morning, the focus is more on afternoon exercise for total relaxation. Participation in all classes is included in the price and always voluntary. The first yoga class in the morning and the evening meditation / grouphealing is given by Yogi Sarath Chandra. Yoga mats and normal pillows are available. Personal cloths and special cushions would have to be brought if desired. Number of participants: the number of seats is limited to max. 10 participants limited. The retreat will be held from 7 participants. If a retreat has to be canceled, the amount paid in will be refunded in full. Overnight: Travel home from Sa on Sun possible, for participants from far away accommodations in nearby hotels (at own expense). Price: 370.- CHF, payable after registration, but no later than 14 days before the beginning of the retreat. The place is valid only after payment as definitely reserved. The application is considered binding. The amount will only be refunded if a replacement for the failing participant (s) can be found. Individual retreat days can only be visited if there are still places left. Unavailable retreat days expire. We ask for your understanding for this regulation; This allows us to keep the retreat fees low. Included in the price is participation in all yoga & meditation classes offered at the retreat, two personal healings by the master, all meals listed above. Insurance is the responsibility of the participants! Important note: 1.) We do not make any promises! 2.) The Healings replace no conventional medical treatment. 3.) Due to the retreat, do not take any medications from you without first talking to your doctor. Ever wanted to go to India for spiritual advancement? You do not have to travel that far. Experience it here in the heart of Europe. In February 2018, Yogi Sarath Chandra gave the first time the opportunity to his students to attend a Kundalini Awakening Retreat. At the Kundalini Awakening Retreat the space is limited. It is therefore recommended to register early. 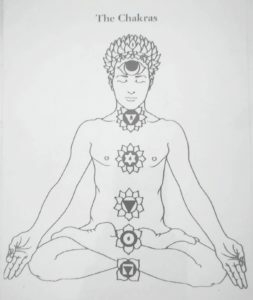 The aim of this retreat is to open the chakras (main & minor chakras, see pictures). Sarath, as an awakened yogi, is able to achieve such an opening in others through joint meditation and energy activation of the participants’ chakras. He uses his own power as a complete chakra-open yogi. The chakras of the retreat participants can and should open up to 100% during the 2-day Kundalini Awakening Retreat! And those who continue to meditate regularly can also keep this condition. The retreat is suitable for meditation enthusiasts who want their own enlightenment through the activation of their own Kundalini energy from the bottom of their hearts and are willing to intensively meditate intensively with the Master during these 2 days. This retreat is not for people who are currently suffering from physical or mental illness or addiction. If you are currently suffering from ailments or mental problems, you are welcome to visit one of our 2 day Yoga Healing Retreats in advance, until you are ready to attend the Kundalini Awakening Retreat. During the Kundalini-Awakening Retreat, a total abstinence from alcohol and other intoxicating substances is required! 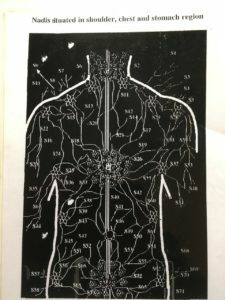 Via the reservation form under Retreat data it is possible to register for one of the upcoming retreats or to book individual healing sessions with Sarath at any time. Personal healings can be booked at the marginal times of Yoga Healing Retreats or at any time as Distant Healing via Video Call. 05:30 Chakra Awakening Meditation with Sarath, then alternating Meditation, Chakra activation and little activating Kundalini Yoga exercises throughout the day. Meditation and Chakra activation will be continued at night. The exact program is determined by the yogi. Number of participants: the number of seats is limited to max. 6 participants limited. The retreat is carried out from 3 participants. If a retreat has to be canceled, the amount paid in will be refunded in full. Meals: it is boiled, eaten and cleaned 3 times a day. Overnight: on mats in the yoga room (early morning meditation already! ), Take a shower during these 2 days, and clothes can be washed by machine. Bring along: only white clothes, sleeping bag, bath towel, personal effects. Price: 1’175.- CHF (overnight stay and intense around 24hours-Chakra Activation in the yogaroom included), 50% payable after registration, the other 50% no later than 14 days before the beginning of the retreat. The place is valid only after payment as definitely reserved. The application is considered binding. The amount will only be refunded if a replacement for the failing participant (s) can be found. Individual retreat days can not be visited. Unavailable retreat days expire. Important note: it is not a luxury retreat; Anyone who wants to participate must be prepared to forego greater comfort in favor of his spiritual advancement. We help each other and is eaten vegan at this retreat. 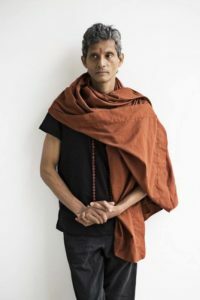 Sarath is currently Sri Lanka’s best-known yogi, who has completed his personal training in Sri Lanka with other renowned yoga masters, taught for years in Sri Lanka, and since 2016, after his marriage, lives and works in Denmark. Fairness ... It is desired that in case of hindrance, the practice appointment be canceled at least 24 hours before by the client (online via Bookingsystem, by email or by phone). Deadlines missed by the client will be charged. Appointments missed by the therapist will be made up for later free of charge, unless the deregistration took place at least 24 hours in advance (online via Bookingsystem, by email or by phone). Retreat fees are payable upon registration, but no later than 14 days before the beginning of the retreat. The place is valid only after payment as definitely reserved. The application is considered binding. The amount will be refunded only if a replacement for the participant can be found. Individual retreat days can only be visited if there are still places left. Unavailable retreat days expire. Insurance is the responsibility of the participants.